Zaun, using our industry leading research and development department have produced a revolutionary perimeter intrusion detection system PIDS fence. The HiSec TubeDetect PIDS fence is designed to incorporate PIDS directly into the fence line, without any cables or wires being on display. This PIDS fence system enables you to protected your key asset perimeter with additional security, whilst hiding the exposed wires from any external threats. 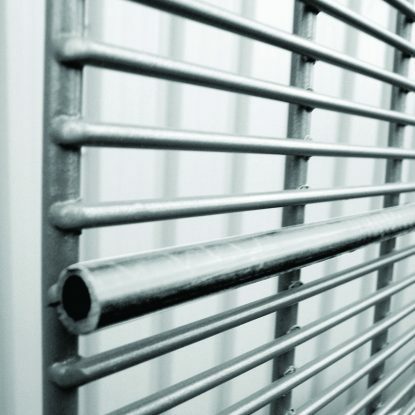 Using flexibility in our mesh manufacturing process, Zaun have been able to produce a traditional HiSec 358 mesh panel with a hollow tube in place of either one or a number of the horizontal wires. This development will allow for discrete placement of microphonic cable systems and also offers protection against tampering. In addition, Zaun can provide a fully integrated perimeter intrusion detection system and fencing in one system. The discrete nature of the product means that would be intruders are unaware of the existence of the PIDs fence system and therefore are easier to track and target. The system is also available in more conventional, medium security fences such as Duo8. Electronic controllers and or interfaces can also be housed in post centres to completely obscure the system. Available with your choice of fence toppings the HiSec Tube Detect PIDS fence system provides a full integrated solution to protect your perimeter. Pedestrian gates are single leaf 1.2m wide, (or width to suit). Framed in a 100mm x 50mm RHS with Zaun HiSec mesh bolted to the frame, with slide latch. Each gate features a rubber bump stop and 2 x suitable gate posts. Vehicle access gates are double leaf (single leaf vehicle gates available) 3.0m wide (or width to suit). Framed in 100mm x 50mm RHS, with Zaun HiSec bolted to the frame, with drop bolts and slide latch. Each vehicle Gate features a rubber bump stop and 2 x suitable gate posts. Samples of Zaun TubeDetect are available upon request, to request your free sample please click here.